And here's a cake to celebrate it! 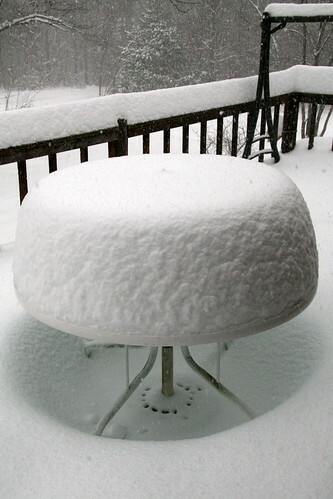 Or rather, it's the table on our deck that we failed to put away before the snowstorm. The winter has barely started and we've been hit by a massive ice storm, and now non-stop snow for three days. It is still snowing heavily as I write this, and the cake will likely get taller, but being the Winter Solstice, the sun sets at 4:16pm today. I was thinking that it was unfortunate that we took our Disney vacation before winter started, and now we have the whole dreary winter to follow with nothing to look forward to. No wonder why everyone wants to go in February. And then I realized that had we gone just one week later, we would have had trouble flying in during the ice storm. And two weeks later, this snowstorm would sure have put a crimp on air travel. After the ice storm, Adam's school was closed on Monday and Tuesday last week to allow continual clearing of the roads. People were still out of power and the middle school was being used as a warm shelter. By Monday afternoon, the school called and said that due to the condition of the roads and impending snow forecast, that the schools would be closed for the rest of the year and reopen on January 5th. Wow! I am so grateful that Doug is home to take care of the kids. I have no idea how families with two working parents manage this unplanned school closing. Since we took Adam on vacation during the first week of December and the school was closed starting Thursday afternoon for the ice storm, he has gone to school for a whooping three and half days in December! He's been sick most of this time, so it's just as well that he take it easy during this time off. Having already used up 8.5 of the school's 5 snow days, I'm not sure what the school is planning to do to make up the days. We started after Labor Day so he'd be going to school in July at this rate. Some New Hampshire towns were talking about canceling midwinter or spring break. I also heard that since a state of emergency was declared after the ice storm, that the schools may be exempt from the required 180 days. I would vote for canceling one of the weeklong vacations. 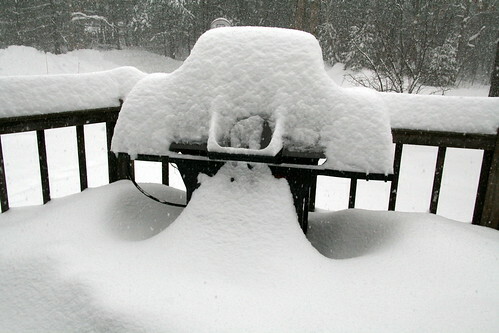 There will be no barbeque's at our house any time soon!